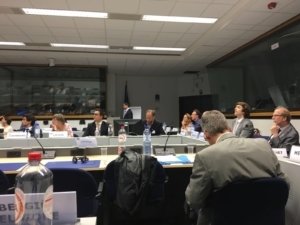 RASOR Project presented at the 10th Copernicus User Forum in Brussels. The RASOR platform was presented within the Italian contribution to the Forum showing the potential for application of RASOR in the Copernicus Context with specific focus in the Value added services to the National Collaborative Ground Segment – Extended. the presentation was well received by the user forum and interest has been raised. The platform has been proposed as a tool to transform EO and non-EO products (with special focus on Copernicus http://www.copernicus.eu/main/services) into services for the end user, providing an “expert” synthesis of complex information, to get to the quantitative analysis of impacts whenever it is needed (e.g. emergencies, climate change, land management).